French-born Malandrino's event today wasn't a runway show, but a "presentation," meaning models lounged around; editors, buyers and celebs stopped by. What they saw were pieces that looked perfect for a a trip to Tahiti — via Paris. Fringe and patterns make for island-y vibes. For me, this doesn't say "spring" as much as it does "hot summer concert in the park." Which is not a bad thing! Love, love, love seeing black models! The one sitting down is like, "Where is that cappuccino I ordered 10 minutes ago?" The graphic black and white dress in the back might be amazing, but it's hard to tell. This reminds me so much of Anjelica Huston's character in The Life Aquatic WIth Steve Zissou: The elegant ex-pat island dweller with enormous statement jewelry. I long to be her. Yes on the crocheted cropped jacket; no on the crotch of the pants on the left. Hey look, it's Mary J. Blige! Catherine Malandrino, right, must have walked her through the show. That berry-colored dress is ridiculously cute and made for dancing all night on the beach; the turquoise top in the back on the right is probably pretty great, too. 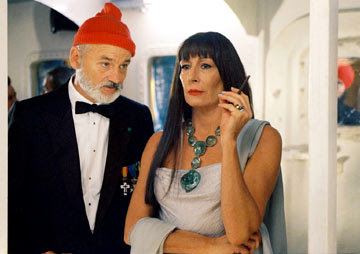 Although this is also very Anjelica Huston in Life Aquatic, it also reminded me of the maharajah in Indiana Jones And The Temple Of Doom. I really do love that Malandrino's playing with proportion: The teeny jacket, with a jumpsuit that goes from being voluminous to skinny. But there's only one person this looks good on, and she is wearing it. Also: These three women would make a badass motorcycle gang. Aloha, ladies! Gorgeous sea-colored dress, and cute shorts, too. Another winner: Easy, relaxed, but still flattering and not at all messy. And if barefoot is in for spring, then I'm super stylish right now!